These two bathrooms have a beautiful, timeless design. The customers chose the same white and neutral colour scheme in both the bathroom and ensuite to create uniformity within the home. 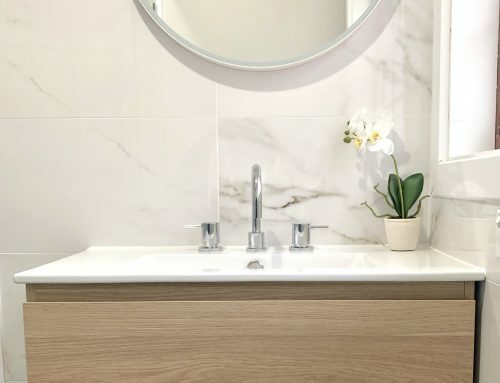 Both bathroom & ensuite use gorgeous timber look tiles that contrasts perfectly with the white gloss walls and fixtures. Gorgeous white free standing bath with timber tile feature wall with decorative niche – bathroom renovation by Master Bathrooms & Kitchens. 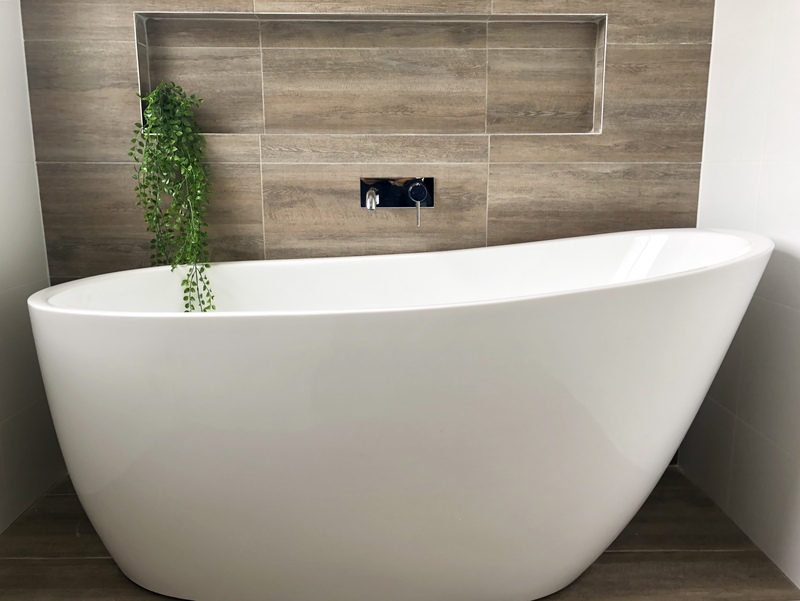 In many homes, it is the main bathroom that is slightly larger of the two bathrooms and contains both a bath and shower, whilst as the ensuite is quite often smaller, leaving room only for the shower recess. It is the opposite in this home. The bathroom contains a large shower recess and the ensuite in this case features both a free standing bath and shower. This makes this ensuite bathroom the perfect private sanctuary to relax and retreat to after a long, hard day. 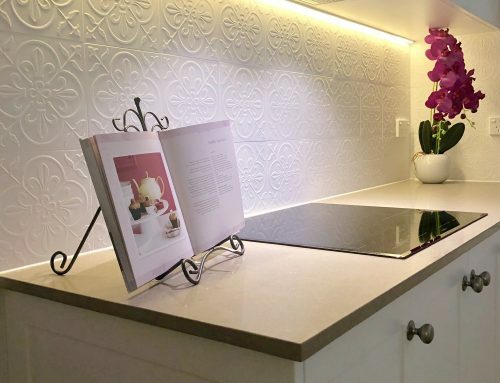 The walls in both rooms are tiled to ceiling height with white gloss 300 x 600mm wall tiles. The floor in the bathrooms are tiled with 300 x 600mm timber look tiles. 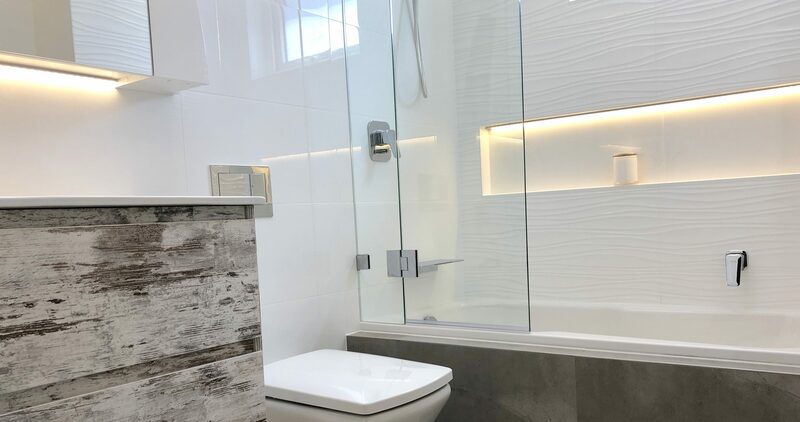 Both bathrooms have a stunning feature wall tiled with the same 300 x 600mm timber look tiles which adds warmth and character to the bathroom. 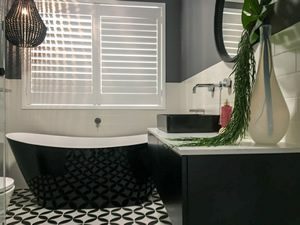 The bathroom feature wall is set in the shower recess with a niche and the ensuite feature wall is set behind the free standing bath again with a decorative niche. 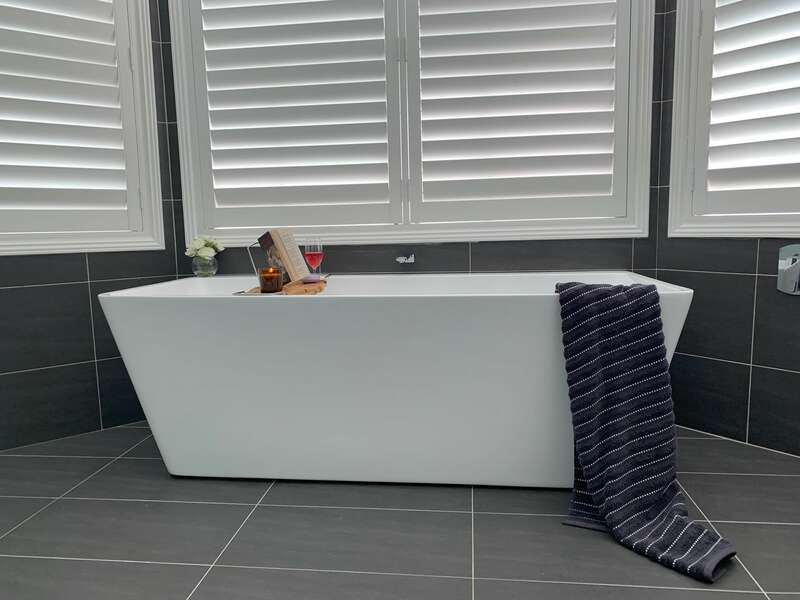 Using the same tile as the floor for the feature wall creates such a stunning effect in a bathroom as we are sure you’ll agree. 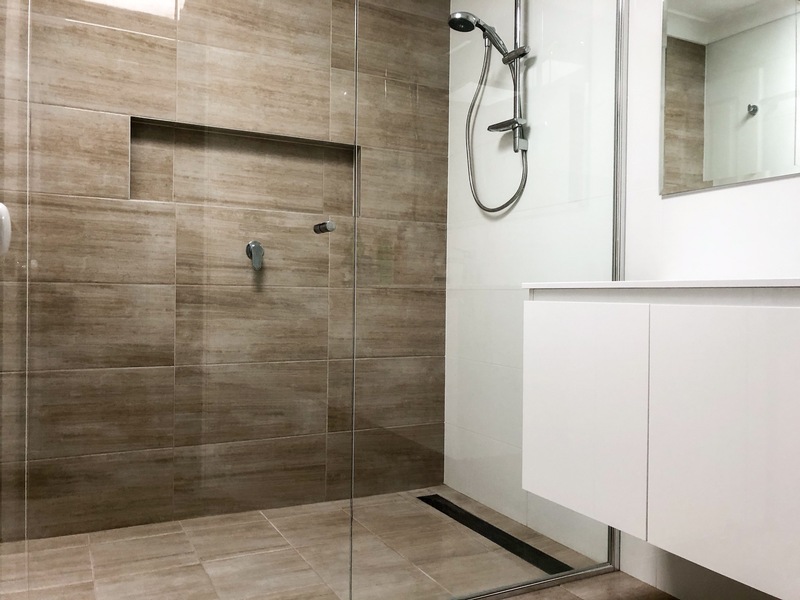 Bathroom shower recess with timber tile feature wall, shower niche, linear shower grate and semi-frameless shower screen – bathroom renovation by Master Bathrooms & Kitchens. 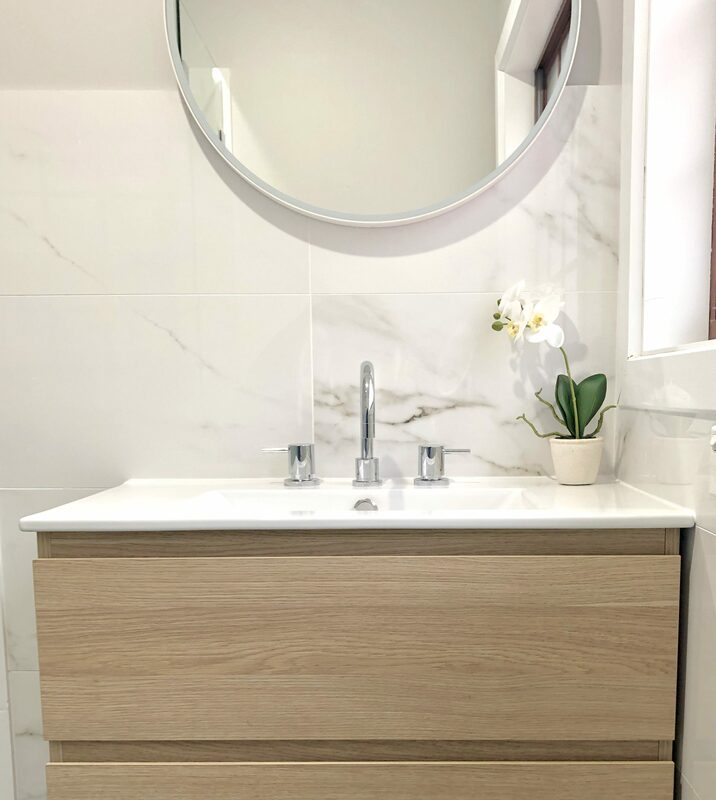 Beautiful white free standing vanities with chrome mixer taps, large mirrors and under cabinet lighting were installed in both bathrooms; 1200mm for the ensuite and 1500mm in the bathroom. 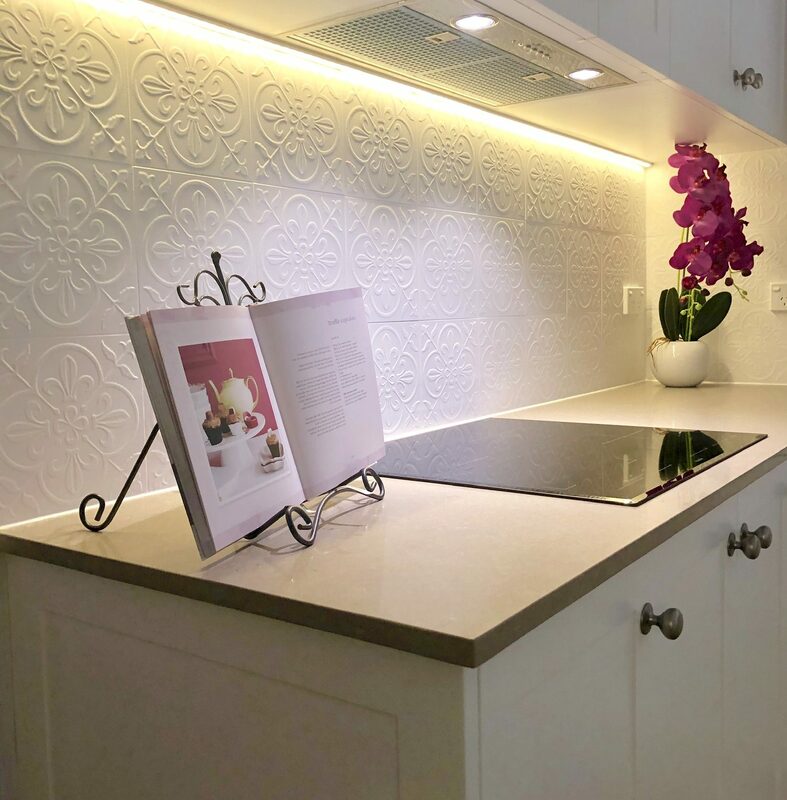 Under cabinet lighting is a soft lighting that serves as a feature lighting that is also practical for use during the night as it can be triggered by a sensor to turn on and set to a timer to automatically turn off. This type of lighting is particularly useful in ensuite bathrooms as the lighting is so soft that it does not disturb sleeping partners. 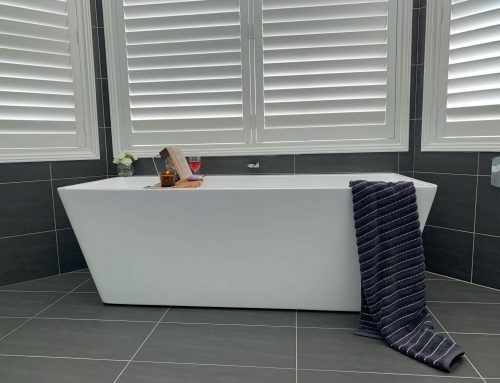 The ensuite features a stunning white free standing bath that contrasts perfectly against the timber tile feature wall with decorative niche and chrome wall mixer and spout plate combination. The shower recess in both bathrooms feature a shower niche that is perfect for storing shower toiletries, chrome rainfall shower with adjustable hand held shower rose, linear shower grate and semi-frameless shower screens. 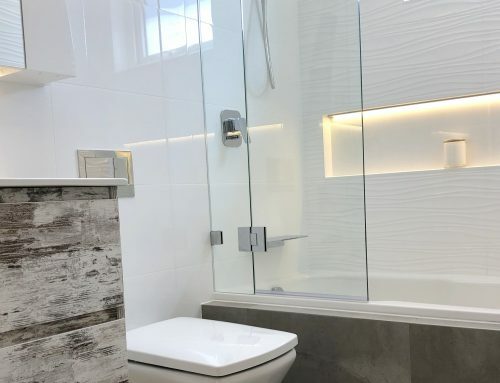 Both bathrooms had white back to wall toilet suites installed which blend in seamlessly with the white wall tiles and make cleaning the toilet quick and easy. Chrome accessories were fitted throughout both bathrooms to blend in with the chrome tapware. See more our of work here or go to our Guides and Projects section. Master Bathrooms & Kitchens is a bathroom and kitchen renovation company that is family owned & operated. 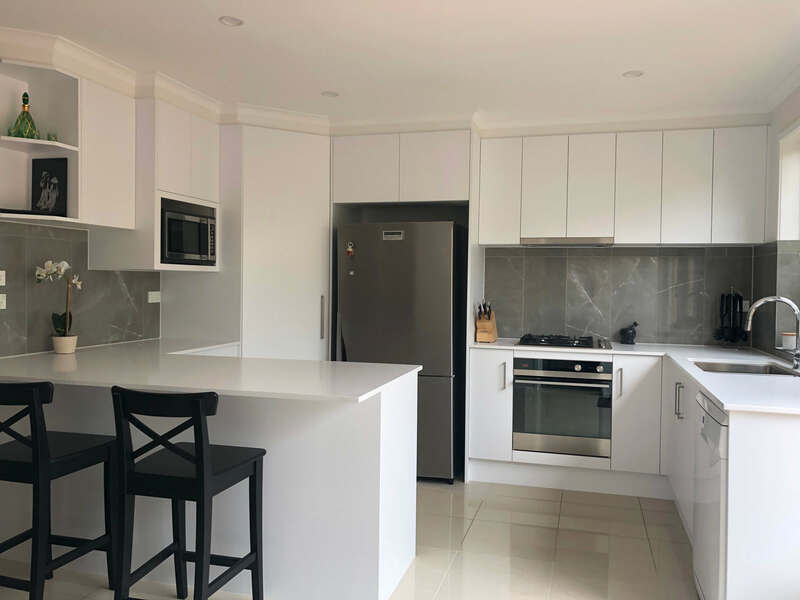 We have been renovating the Hills & Hornsby areas since 1995. 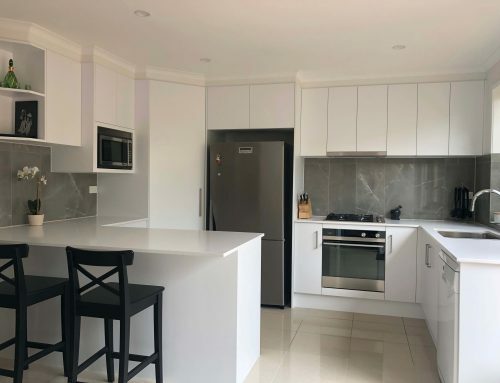 Peruse our website for more renovation inspiration and valuable advice or call us on (02)9899 9330 to discuss your renovation needs and organise an in home quotation today.